Today we expect Mario Draghi to speak before the Committee on Economic and Monetary Affairs at 15:00 (CET) in Brussels. Investors are willing to listen for the ECB President’s comments regarding the low inflation rate and the EU economic slowdown. The main danger for the EU economy is still the possibility of deflation with a consequenе reduction of revenue and output profitability. Mario Draghi’s speech may affect the volatility of the most liquid currency pairs which are exposed to the EU monetary policy. 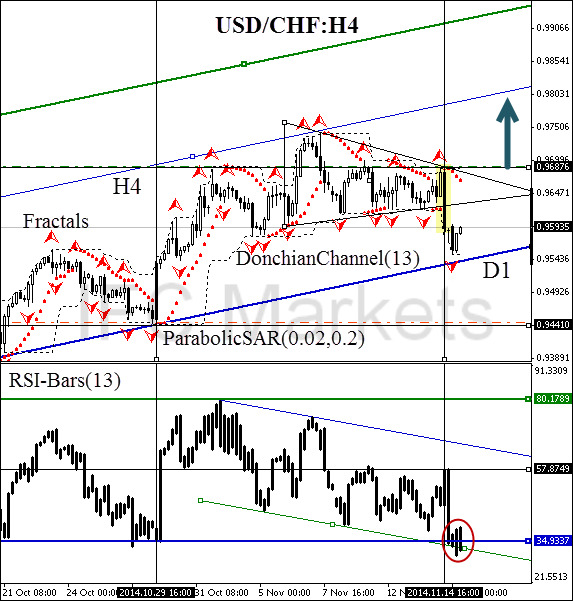 Here we consider the USD/CHF currency pair on the H4 chart. The price is still moving in the daily uptrend, but there is a number of alarming signals of the trend fading out. First of all, they include the lower triangle side breakout, which coincides with the bearish candlestick pattern “absorption” (marked in yellow on the chart). Secondly, the price is drifting in the lower part of the price channel. Finally, RSI-Bars oscillator signal indicates the bearish divergence and broke the lower boundary of the sideways channel at 34.9337%. The bullish backtrack is possible only after a significant market restructure. Note the necessary condition for this: the upper triangle side breakout at 0.96876. It will result in the Parabolic trend indicator reversal in the direction of the green zone, and the intersection with the upper Donchian Channel boundary. Conservative traders are also recommended to wait for the breakout of the oscillator resistance level at 57.8749%, which would erase the bearish divergence. The price level at 0.96876 can be used for opening a pending buy order with Stop Loss placed below the last fractal low at 0.94410. The proposed Stop Loss level is confirmed with the D1 trend line intersection, Parabolic historical values and also the lower Donchian Channel boundary.